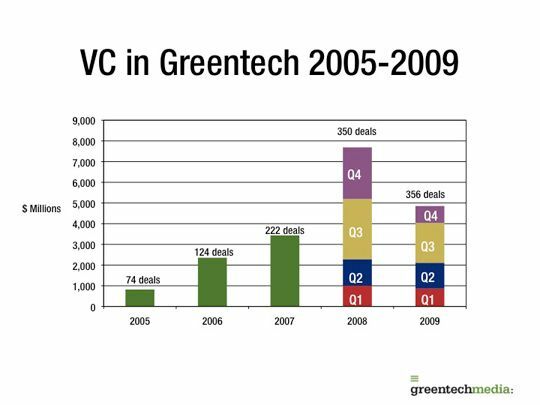 Venture capital firms have invested almost $20 billion into hundreds of greentech startups since 2005. All of these firms are looking to launch a disruptive force into their target markets, scale rapidly and grow quickly. Very few of these firms will actually make it. 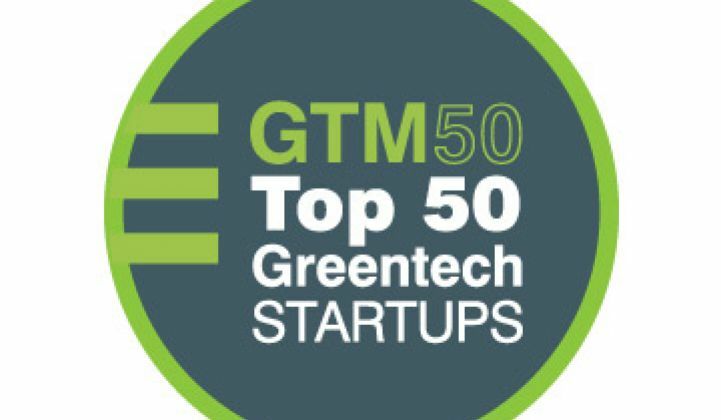 We put our energy analysts, reporters and editors to the task of picking fifty VC startups in greentech that have at least a fighting chance of succeeding as VC-funded start-ups and making an impact on our energy-intensive lives. Methodology: We spread the names of 500 VC-funded firms on the Greentech Media dance floor and cut the head off of a chicken. Wherever the chicken landed - that was a winner. We stopped when we ran out of chickens. Brightsource Energy: Big-name investors, a large war chest, a partnership with construction-giant Bechtel, more than a gigawatt in California utility PPAs and $1.37 billion in federal loan guarantees make this power-tower solar thermal player an easy choice. Now the challenge is getting past further environmental objections to its first 396-megawatt power plant. Chromasun: Air conditioning accounts for fifty percent of the demand for power during peak periods in California, according to Peter Le Lievre, founder of Chromasun. It's an enormous problem and market awaiting a solution. Chromasun uses solar thermal collectors to gather solar heat to run a double effect chiller which curbs peak power, broadens the market for solar thermal technology and fits well within the practices of the building trades. Enphase Energy: This well-funded microinverter innovator has shipped more than 120,000 units for residential and commercial deployments. The contract manufacturing model is working and the company continues to grow. There are a number of microinverter startups but Enphase is the only one to reach credibility and volume shipments in a high-growth $2 billion market. eSolar: Fifteen months ago, eSolar was on the ropes. It desperately sought funds to build solar thermal power plants. It then switched strategies and decided to license its technology and sell equipment, leaving the actual building of the power plants to others. Since then, it’s signed deals that will lead to gigawatts worth of its solar technology planted in China, India, Africa and the Middle East. A 5 megawatt demo plant went up last year and construction on the first 92 megawatts begins this year. The secret sauce: software that helps improve the efficiency of the overall plant. Funding from Google, India's Acme Group, Oak Investment Partners and NRG Energy. Innovalight: The silicon nano-ink developer recently pivoted its business plan and shifted from solar panel manufacturing to panel manufacturing along with licensing and joint ventures. Innovalight's inks allow silicon wafer manufacturers to boost their cell efficiency by up to 2 percent with a low capital outlay. This could be one of the last novel, "new" type of solar cells to make it out for a while. Nanosolar: The CIGS thin film pioneer got started in 2002, making it one of the earliest thin film companies supported by Silicon Valley. Since then, Nanosolar has used every avenue of funding to fund their potentially disruptive solar firm, now at about $500 million in funding to date. Nanosolar is shipping product in the 10 to 12 percent efficiency range and has panels in the lab topping 16 percent efficiency. Nanosolar faces the same challenge as every other solar panel manufacturer -- keeping up with silicon and cadmium telluride prices and efficiency. Petra Solar: Not so much a technology play as a channel play, Petra Solar and its more than $50 million in VC funds is exploiting an untapped sales channel - solar panels on utility and power poles. Petra has a large contract with Public Service Electric & Gas, New Jersey's biggest power utility, to install solar panels on streetlights and power poles across the distribution network. PSE&G looks to install 200,000 panels and about 5 percent are up so far, according to PSE&G. Potential for high growth in a new application. SolarCity: Fast growing SolarCity has emerged as one of the largest residential solar installers in California and has moved into other solar-friendly states. The start-up has innovated in the installation field as well as in the financial field by offering leasing options for homes and small businesses. U.S. Bancorp has set up a $100M fund to finance SolarCity's residential and commercial installations. Entrepreneurs are needed in the downstream solar business as much as in the technological side. Solyndra: With almost a billion dollars in venture capital and half a billion in DOE loan guarantees, Solyndra is the clear winner in the money raising contest. The CIGS thin film solar company's S-1 is filed and the firm has customers and $58.8 million in revenue in the 9 months ending Sept, 30 2009. The investors and the company claim immense savings in balance of system costs. But skeptics abound and many believe that the company’s solar panels are more expensive than the competition. CIGS solar cells aren’t easy to make and Solyndra's cylindrical design adds to the complexity. The debate won’t be answered until the customers start taking their data public. Suniva: Well-funded Suniva has made numerous technological advances to raise crystalline silicon solar wafer efficiency and lower manufacturing cost. Investors NEA, Goldman Sachs and Warburg Pincus have invested more than $125 million. SunRun: SunRun is a home solar service company located in San Francisco, California that offers residential PPAs: "home solar as a monthly service." The company has seen 8 to 10 times growth over last year. SunRun has received venture funding from Foundation Capital and Accel Partners, as well as a $105 million tax equity commitment from an affiliate of U.S. Bancorp. Residential PPAs from SunRun might be the disruptive piece that allows solar to better penetrate the residential roof market. Arcadian Networks: Arcadian Networks designs and delivers wireless communication networks to utilities based on the private (licensed), secured 700 MHz spectrum. The 700MHz appears to be a better choice (than 900Mhz) is rural areas, since the signal can travel farther without relays and can penetrate physical obstacles (such as crops and hilly terrain) that higher frequencies may struggle with. The other major advantage of the 700MHz spectrum is that because it is licensed there is not any interference from other sources. While 900MHz mesh networking solutions have dominated the market due in part to their lower costs, as interference continues to create problems for utilities, and as “intelligent provisioning” becomes more common, expect Arcadian Networks to compliment 900MHz networks in situations were interference is just not acceptable. This month Arcadian announced the release of their 2nd generation router/gateway adding the ability to link with WiMax. While this router can also connect to all other major communication networks (3G/4G, 900 MHz, Ethernet, etc) clearly, Arcadian is doubling down on licensed networks for smart grid. Better Place: A $350 million dollar funding round in January ranks as one of the largest cleantech deals in history with a pre-money valuation of $900 million. Commercial launch is targeted for 2011 for the bold electric-vehicle / charging-station / battery-swap / electricity-selling start-up with an inital focus on Israel and Denmark. Investors include HSBC, Morgan Stanley Investment Management, Lazard Asset Management, VantagePoint Venture Partners, et al. Better Place is looking to install between 15,000 and 20,000 charging stations in both Israel and Denmark in the near-term. There is the suggestion that this firm could be a Google or Netscape-type market disruptor. But even a dominant role as an urban vehicle, as a fleet vehicle, as a delivery vehicle lets Better Place win big in a niche market. CPower: With 800 megawatts of demand response curtailment under management, CPower is the third largest player in this emerging demand response/energy management market. Why do we offer you #3, and not the #1 or #2? Good question. Those competitors, EnerNOC and Comverge have already gone public, that’s why. Like their more-public-piers, CPower is looking to quickly move into other energy services, including reserves & frequency regulation, renewable energy credits, and energy efficiency for consumers. Last year the company doubled their curtailment load, became the largest aggregator on the Texas (ERCOT) grid, and now claims to provide demand response services to over 1,600 different retail sites. SCE, PG&E and Ontario Power Authority are all utility clients. The company’s investors include Bessemer Ventures, Schneider Electric Ventures and Intel Capital. Coulomb Technologies: Coulomb builds a vital piece of the EV infrastructure -- charging stations connected to the grid with power and data. Coulomb was founded on two premises -- that every charge station should be networked and that Coulomb needed to be a self-sustaining business model -- they win revenue from the sale of the charge station and from fee-based charge services. Investors include Voyager Capital, Rho Ventures, Siemens Venutre Capital and Hartford Ventures. EcoLogic Analytics: EcoLogic Analytics provides meter data management (MDM) software solutions and decision management technologies for utilities. They offer a suite of software solutions that include gateway engines, meter data warehouse, meter read manager, meter reading analytic, navigator graphical user interface, automated validation engine, network performance monitor and reporting engine, real time outage validation engine, data synchronization engine, calculation engine and residential rate analysis API, and virtual metering aggregation components. Their MDM solutions also integrate with other systems, such as CIS/billing, to deliver data to business users in the enterprise. EcoLogic Analytics was chosen as the vendor to provide MDM for PG&E, the biggest AMI deployment in North America – a huge win for the company. In February 2009, the company landed its second major contract with Texas utility Oncor and will serve as the MDM provider for more than three million electric meters in Oncor’s service territory. eMeter: eMeter makes software that manages the enormous volume of data coming from smart meters, providing both MDM and AMI integration for utility information systems. eMeter’s solutions also allow for demand response and real-time monitoring of resource usage, yielding greater energy efﬁciency and more reliable service, while minimizing the costs of AMI deployment, data management, and operations. The company competes with AMI companies that can provide their own software AMI and MDM software such as Itron and Sensus, as well as other software companies such as Oracle. In early 2009, eMeter announced a deal with CenterPoint Energy to support the Texas utility’s plan to install two million smart meters in its territory. That follows deals with Alliant Energy, Jacksonville Electric Authority, the Canadian province of Ontario, and European energy company, Vattenfall. The company claims to have more than 24 million meters under contract. That number gets it a spot on the list. eMeter has transitioned from just providing MDM solutions for utilities into consumer services, such as demand response and consumer portals, following a strategy that seems to be working among smart grid players: get your foot in the door with one solution, then seek to expand. Proximetry: Proximetry provides network and performance management solutions for wireless networks to enable network operators to visualize, provision, and actively manage their networks, especially to support mission-critical communications. The company's software solution, AirSync, enables real-time, network-wide visualization, management, and active network control from a single system and location for multivendor, multifrequency, multiprotocol wireless networks. This so-called "intelligent provisioning" which provides "dynamic bandwidth" matching network resource priorities to user and device needs seems like a logical extension of smart grid networking, and we expect this to be a major new trend going forward. Proximetry is currently working San Diego Gas & Electric, widely considered to be one of the most innovative utilities in North America. Silver Spring Networks: Silver Spring Networks has been plugging away at standards-based networking for smart meters for close to a decade -- building routers and hubs that connect via a wireless mesh protocol. The firm has made announcements of utility contracts with Oklahoma Gas & Electric, Sacramento Municipal Utility District, AEP and Florida Power & Light and closed a $100 million investment from blue-chip VCs including Kleiner Perkins and Foundation Capital, bringing its VC total to north of $250 million. This month Silver Spring declared it's intention to go public with an IPO underwriter bake-off -- the S-1 filing should follow soon. Revenues are estimated in the $100 million range. Easily the leading VC-funded smart grid start-up. SmartSynch: SmartSynch's GridRouter is a modular, standards-based, upgradeable networking device that can handle almost any communications protocol that a utility uses. Four networking card slots allow a single box to handle ZigBee, WiFi, WiMax or other proprietary communications standards simultaneously. The cards can be removed so utilities can swap out and/or upgrade their networks without replacing the basic piece of installed equipment. It provides communication to any device on the grid over any wireless network, according to the CEO, Stephen Johnston. Potentially, that could eliminate some of the fear and uncertainty surrounding smart grid deployments. The Tennessee Valley Authority selected SmartSynch to serve as the communications backbone in its renewable program. Tendril Networks: Tendril makes a varied suite of hardware and software solutions for applications such as demand response, energy monitoring, energy management and load control. It offers an energy management system for consumers (based on the ZigBee HAN standard) and utilities, smart devices (such as smart thermostats, smart plugs, and in-home displays,) as well as web based and iPhone enabled displays and energy controls. The company also develops applications for utilities such as network management, direct load control, customer load control. The startup has deals in place with more than 30 utilities and had a large commercial roll out in 2009, along with a number of ﬁeld trials. In June 2009, the company raised a $30 million third round, bringing its total to more than $50 million and making it one of the better funded private companies competing in the Home Area Network space. General Electric's Consumer and Industrial division has teamed up with Tendril to develop algorithms and other technology that will allow utilities employing Tendril's TREE platform to turn GE dryers, refrigerators, washing machines and other energy-gobbling appliances off or on to curb power consumption. The GE deal gets the company on the list. Runner-up: EcoFactor. Trilliant: Trilliant provides utilities with wireless equipment and management software for smart grid communication networks. In 2009, Trilliant acquired SkyPilot Networks, a manufacturer of long-range, high-capacity wireless mesh networks. The acquisition allows them to offer complementary networks, both the neighborhood network and the wide-area network. Trilliant's largest deployment is 1.4 million device network spread over 640,000 square kilometers for Hydro One in Ontario, Canada. The company has been around for years so defining it as a start-up is tough, but it has been on this tack for only the last few years. Adura Technologies: Approximately 85 percent of commercial office buildings in the U.S. are illuminated inside with fluorescent tube lights. In the vast majority of cases, these bulbs can’t be dimmed or turned off remotely. Only around 1 percent of lights in California office buildings are networked. Adura has created a wireless mesh system that effectively flips the lights off when you’re not around and dims them when the sun is out. In a recent test conducted by PG&E, Adura managed to cut the power delivered to lights by 72 percent. Next, the company plans to connect its software to other devices in buildings. VantagePoint is a lead investor. Runner up for networking: Lumenergi. Bridgelux: Bridgelux is focused on lowering the cost of LED-based solid-state lighting to a penny per lumen -- a disruptive price achieved through clever packaging and innovating in the expitaxial processes of building the phosphor-coated film. Early this year, new CEO and ex-Seagate CEO, Bill Watkins took over the reins and announced a $50 million funding to finance a new fab, bringing its substantial fund-raising totals to over $150 million from investors including DCM, El Dorado Ventures, VantagePoint Venture Partners, Chrysalix Energy and Harris & Harris Group. Our sources indicate that the firm is generating significant revenue. The big question is whether they can outrun the big guys like Philips and Osram. Optimum Energy: Buildings consume 40 percent of the energy in the U.S. and 76 percent of the electricity. HVAC is the low hanging fruit of energy efficiency in commercial buildings and where we can make an enormous impact in energy usage. Optimum Energy develops networked building control application and products to reduce energy consumption in commercial buildings -- reducing energy consumption and GHGs while increasing operating efficiencies in HVAC plants. Optimum makes software that dynamically controls the chillers – the enormous machines that cool water for air conditioning systems in skyscrapers. According to the company, there are more than 150,000 buildings that can use their product and if the software was used in each one, 75 gigawatts could be taken off the grid. Adobe has installed it. Recurve: Formerly Sustainable Spaces. They do energy efficiency retrofits. Recurve is assembling a dynamic software package that will allow contractors large and small around the world cut down the time, cost and errors in conducting retrofits. A lot of the employees come from Google—you can’t say that about other construction companies. In fact, a number of large contractors are testing it out now. Co-founder Matt Golden is also one of the driving forces behind the $6 billion Cash for Caulkers program recently introduced by Obama. Recurve’s next policy initiative: funding retrofits by getting them classified as carbon credits. Redwood Systems: The company, which has received money from Battery Ventures and others, will soon disclose their technological angle, but the gist of it is this: Redwood replaces lighting wires and regular light bulbs with Ethernet cables and LEDs. Suddenly, you have a network in your ceiling that every light, smoke detector and other device can link into. Founders hail from Grand Junction Networks, the Fast Ethernet pioneer turned gold mine for Cisco when acquired in 1995. Serious Materials: A bit heavy on hype, but Serious has the beginnings of revenue and has just won the Empire State Building retrofit project for their thermal windows. The company appears to have hit some speedbumps with its drywall product. But high-end investors like Foundation Capital and high-voltage staff like CEO, Kevin Surace have kept green building materials in the news, in the public imagination and in the tax credit checkbooks of the U.S. government. Sources indicate revenue between $25 million and $50 million in 2009. Amyris: Rumors abound that Amryis, a synthetic biology start-up spun out of UC Berkeley with more than $150 million in funding, could soon file its S-1. Amyris develops microbes that feed on sugars and secrete custom hydrocarbons for conversion into jet fuel, industrial chemicals or biodiesel. Amyris claims to eventually produce biodiesel that can wholesale for $2 a gallon. In late 2009 the firm paid $82 million to Brazil's São Martinho Group for a 40-percent stake in an ethanol mill project and entered into agreements with three other Brazilian companies to produce ethanol and high-value chemicals. LS9: The company's scientists have engineered a strain of E. coli with a genome that can convert sugars into a fatty acid, methyl ester, which is chemically equivalent to California Clean diesel. It's a completely unnatural act but could lead to $45 a barrel biodiesel. LS9 hopes to show that the process is feasible next year. Added bonus: LS9 does not have to kill its microbes to get the oil. They secrete it naturally and then can live to feed, digest and excrete more dollops of oil. It's not out of guilt: re-using a microbe instead of cultivating a new generation cuts time and costs. Another added bonus: the company is working with Procter & Gamble on green chemicals and with Chevron on fuel. Sapphire Energy: Sapphire eventually hopes to produce hydrocarbons from genetically modified algae grown in open ponds. Conceivably, it could be the cheapest and fastest technique for producing algae fuel. But it's also fraught with complications. Growing algae in open ponds for fuel oil at the moment is expensive and complex, and keeping GMO strains from being out-competed by natural strains in the open is even more daunting. The company has raised $100 million plus from top-flight VCs, including the firm that invests on behalf of Bill Gates, so stay tuned. Solazyme: One of the oldest algae companies and the one that's also the furthest along. Solazyme eschews growing algae in ponds or bioreactors through photosynthesis. Instead, it puts algae in beer-brewing kettles, feeds them sugar and grows them that way. The sugar adds to the raw material costs, but Solazyme makes up that cost because it doesn't have to extract the algae from water, one of the most vexing problems facing most algae companies. Solazyme says it will be able to show that its processes can be exploited to produce competitively priced fuel from algae in about two years. It has produced thousands of gallons already and has a contract to produce 20,000 gallons of fuel for the Navy. The company is already selling algae for revenue to the food industry. Chevron is an investor. Synthetic Genomics: In July of last year, Synthetic Genomics announced a $300 million agreement with Exxon to research and develop next-generation biofuels using photosynthetic algae. Synthetic Genomics' dynamic founder, J. Craig Venter, was quoted as saying, "I came up with a notion to trick algae into pumping more lipids out." Venter is a man of action and vision and if anyone can make algae produce hydrocarbons directly, it's him. In addition to the $300 million from Exxon, Synthetic Genomics has received funding from Draper Fisher Juvetson, Meteor Group, Biotechonomy, BP, et al. Bloom Energy: Ten years in the making and $400 million from Kleiner Perkins for this solid oxide fuel cell developer garnered them a stellar list of customers, a high-powered board and a hype-tastic coming-out party on 60 Minutes. Now they have to make the economics of fuel cells work. The Bloom Energy Server costs $700,000 now. Deeya Energy: A few years ago, flow batteries were exotic, barely understood pieces of equipment. Now at least five start-ups have received funding. Deeya was first. It has created a battery in which electrolyte flows in and out of the battery so it always stays charged. Utilities and cell phone carriers that need remote power will be the primary customers. Last year, the company started shipping its first commercial products. The products cost around $4,000 a kilowatt (or about half what Bloom currently sells its products for) and hopes to bring down the price to $1,000. EEStor: This ultracapacitor aspirant makes the list by virtue of the hype and craziness that surrounds it. Kleiner Perkins was an original investor but appears to have backed away from EEStor as the company's corporate milestones and technological claims became less credible. The firm is attempting to make material advances in ceramic powders used in high energy ultracapacitors. The company has no revenue, no prototype, no customers -- but it has garnered an obsessed cadre of fan-boy supporters. General Compression. The cheapest form of energy storage remains compressed air, according to EPRI. To date, however, compressed air has relied upon finding geological formations where you can stuff thousands of cubic meters of air. General Compression, along with SustainX and Isentropic Energy, want to change that with mechanical systems. Both General (which recently raised $17 million) and Isentropic employ pressure and temperature differentials to store and generate heat. Duke is building a 2-megawatt trial facility for General. Coda Automotive: Later this year, Coda will attempt to market an all-electric, mid-priced sedan to American drivers. Car start-ups like Tesla and Fisker have initially aimed at the top end of the market, where price and volume are less important factors. Can Coda, and the similarly situated BYD, do it? The entire auto market will be watching closely. Coda and BYD also will represent China’s first major foray into the U.S. auto market. Coda’s car -- which is based around a Chinese gas-burning car that’s been retrofitted by U.S. engineers -- will be assembled in China and come with a battery made through a joint venture between Coda and Lishen. A Chinese bank has agreed to lend $450 million to the battery venture. Investors include Hank “Give me $800 billion, no questions asked” Paulson. BYD counts Warren Buffet as an investor. Fisker Automotive: A luxury EV, but unlike the Tesla, the Fisker Karma is a plug-in hybrid, combining a battery and an ICE. This firm is another Kleiner Perkins portfolio company and uses batteries from A123. A123 was also an investor in their most recent $115 million funding round. The car sells for $87,900 and already has more than 1,400 people on the waiting list. Hendrik Fisker is a noted car designer who has worked with, among others, Aston Martin. Tesla Motors: The little EV company that might. Teslas has shipped about 1,000 units of their speedy Roadster model, opened up retail outlets in the U.S. and Europe, and just filed their S-1, which showed them raising $442 million in VC and reaching revenues of $93.3 million in the nine months ending Sept. 30, 2009. The next step is building the all-electric sedan, with far more ambitious volume sales goals. Laurus Energy: Funded by MDV in an $8.5 million round and helmed by energy exec Rebecca McDonald, Laurus extracts energy from coal in the form of syngas while it is still in the ground using a process known as UCG -- underground coal gasification. Laurus then fractionalizes the syngas: carbon dioxide is separated and sent via a pipe to oil fields, where it is injected into other wells to help pull crude out of the ground. The rest of the gases -- a combination of hydogen, methane and hydrocarbons -- are then burnt in a gas-fueled power plant. Power from coal is not going away, so any disruptive technology that lowers the carbon footprint of coal and eliminates mountain top removal can be a new untapped piece of the energy mix. It is currently working with a Native American tribe in Alaska to build a UCG vein with a power plant. Nuscale: NuScale’s modular nuclear reactor design could disruptively shift development away from the “cathedral model” of large-scale, over-budget, ten-year nuclear power plant projects. Investor in NuScale and partner at CMEA, Maurice Gunderson suggests that small modular reactors are the "game-changer" in energy technology. NuScale can manufacture modular reactors on a factory assembly line –- and cut the time to develop a nuclear plant in half. “Nuclear is necessary, doable, and the markets are gargantuan,” adds Gunderson. However, the question of whether nuclear belongs on a greentech list always results in vigorous debate. Nordic Wind Power: With funding from Khosla Ventures, NEA and Novus Energy Partners, Nordic Wind Power is the only wind turbine company in the U.S. to get a DOE loan guarantee -- $16 million under the innovative renewable energy program. Nordic also received "significant" funding from Goldman Sachs in 2007. Their groundbreaking 1-megawatt 2-blade turbine design challenges the traditional wind turbine design paradigm. Potter Drilling: Geothermal provided 4.5 percent of California's power in 2007 and advocates say that more power could be extracted from underneath the ground, even in non-geothermal hot spots. The problem has been getting to it economically and safely. Potter, founded by oil industry alums, has come up with a way to drill that's five times as fast and far less costly. Google.org is one of its investors. Ze-Gen: Ze-Gen dips organic landfill waste into molten iron and turns it into biogas. The architecture of the system eliminates many of the inefficiencies associated with biomass. It has a pilot plant and raised $20 million in a second round last year. The big challenge is in getting a production plant off the ground. Oasys: This water start-up is built around research from Yale with $10 million in venture funds to see if its novel desalination technique, which exploits fundamental chemistry and waste heat, can go commercial. The company claims its "forward osmosis" process can desalinate water for about half the cost of standard reverse osmosis desalination. Miox: The disruptive aspect of Miox' business plan is distributed water purification instead of the current centralized model. The company makes onsite water purification systems for gray water remediation and water recycling. Distributed water purification could potentially open up a flood of investment into water. Miox's trick is in making the process cost-effective. The company's system can purify a given amount of liquid with a volume of salt that is one-fourth the amount of liquid chlorine that would be required. Investors include Sierra Venutres, DCM, and Flywheel Ventures. Purfresh: If you drink bottled water or eat bagged organic lettuce, you've encountered Purfresh. The company, backed by Foundation Capital, kills microbes with ozinated water. Growers use it to keep food fresh on the way to store shelves and bottlers use it to sterilize plastic. Orders go up every time an E. coli outbreak occurs. Like Serious Materials, Purfresh is expanding from its base to become a full-service water and food company. Hara: Originally funded in 2008 by Silicon Valley heavyweight VC Kleiner Perkins, Hara has been making good headway attacking the nascent carbon accounting and management software space. It's still early days for this market, but a very large base of enterprise companies are actively looking for software solutions that provide actionable information, metrics, recommendations and reporting regarding their carbon footprints. Hara has amassed an impressive list of customers to date, including Coca Cola, News Corp., Akamai, Intuit, Brocade and Safeway. Sandforce: The company has created a chip that makes it possible for search companies, banks and other companies with large datacenters to swap out storage systems made out of hard drives in favor of drives made of flash memory, which only use about 5 percent of the power. In real terms, that means dropping the power budget for storage systems from $50,000 for five years to $250. Storage giant EMC has invested. Did your company make the list? Copy and paste the code below to display this badge on your site!